Staff were very friendly and helpful. Hotel was pretty and quirky. The welcome from Lien at the reception was delightful. She was cheerful and informative and made sure our room requests were fulfilled. The en-suite room was very comfortable Location was superb. A five-minute walk took you to the lovely beach and a two-minute walk took you to the town centre. Breakfast was excellent. Everything you would wish for was available and staff went out of their way to provide guests with alternative breakfast items if desired. The hotel is very lovely. It feels like you are living in a house with a lovely and friendly host. I recommend that this place is a nice place to visit! The room was comfortable and just what we needed. Breakfast was amazing and the staff were very helpful. Very friendly staff who all made an effort. Very helpful. The Llandudno Hotel This rating is a reflection of how the property compares to the industry standard when it comes to price, facilities and services available. It's based on a self-evaluation by the property. Use this rating to help choose your stay! One of our best sellers in Llandudno! 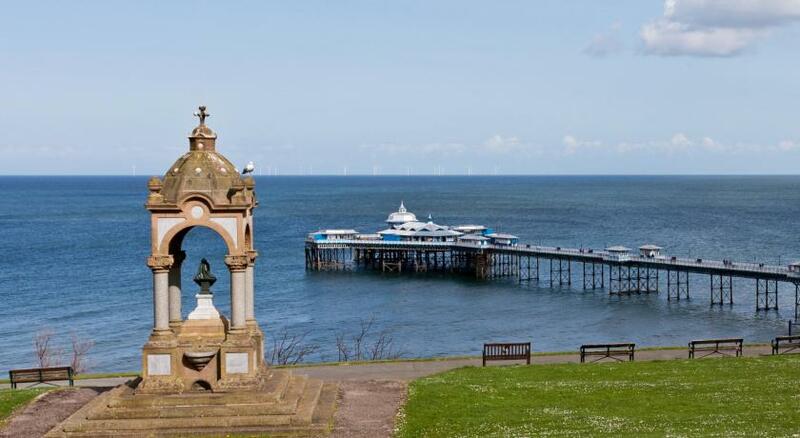 Close to the center of Llandudno, The Lindens has a relaxing, comfortable atmosphere and a large terrace overlooking the sea. It is about 500 feet from the Promenade. The 12-bedroom guest accommodations is well-located for the town center. It is close to the dry-ski slope, the cable car elevator, the Great Orme Tram, the copper mines, Haulfre Gardens and the Great Orme. Each room is en suite and has toiletries, a color TV, tea/coffee-making equipment and a hairdryer. When would you like to stay at The Llandudno Hotel? This family room features a electric kettle and cable TV. This family room features a view and electric kettle. This family room features a bathrobe, sofa and electric kettle. House Rules The Llandudno Hotel takes special requests – add in the next step! The Llandudno Hotel accepts these cards and reserves the right to temporarily hold an amount prior to arrival. Single room occupancy is not accepted on weekends and Bank Holidays. Please note the property is strictly non-smoking. A GBP 100 fee is applicable for smoking on site. Half board rates include complimentary wine. Please note there are additional children's costs for linen and breakfast. Very fresh and plenty of choice for breakfast the staff at this property and so friendly and helpful, I hope the owners realise what gems they have. Room no 1 was really old and in desperate need of a facelift , ( so old in fact I was waiting for a dinosaur to appear any minute ) no chairs in the room to sit on only the bed . Only 2 plugs in the whole room , so therefore if u wanted a cuppa and watch tv and charge your phone it was impossible , no towels in the room on arrival despite have to wait till 3 o’clock on the dot to check in ( the previous week we went to bath and we were allowed to check in at 11.30 ) .And finally breakfast no bacon or fried eggs and what was there was luke warm . The bed was comfy enough . The location was good. Little snacks & drinks in reception were good. Not a critisism about the hotel itself, but unfortunately there were a couple of very inconsiderate guests who made a great deal of noise late at night into the early hours on a couple of the nights. TV blaring until 3am, shouting and generally very noisy. Nice comfortable bed. Good choice at self serve breakfast . Lovely host and made us feel very welcome. The room is probably cooler than some would like although there are good working radiators. One of the windows (behind the bunk beds) rattles quite considerably but one of the kids sorted it; I think he used serviettes. It was particularly windy one night and that’s when the room seemed on the chilly side and the window rattled. The next night I asked for an extra blanket which was promptly provided. The room is quirky with windows on three sides so it’s bound to be cooler. Not a problem. The family room was like a mini attic apartment. Very surprised to find computer, large bathroom, big tv, sofa and wonderfully bright with four windows. The breakfast was great and arrival brunch was great for the kids. The two members of staff we saw were very helpful. Very nice hotel. Ignore the negative reviews, staff very friendly. Nice complimentary snacks n drinks. Mattress was very uncomfortable. There was leftover pizza boxes on top of wardrobe. good value for money clean and comfortable. the staff are very friendly. good choice at breakfast. The outside of the hotel looks outdated and run down. We booked a family room but it was a double room with a bunk bed added so was a bit of a squeeze. We were in room 17 on the top floor so the water pressure in the shower wasn't great. The staff were very friendly and the breakfast was very nice with plenty of choice from cereal, fruit to cooked breakfast. Location is great too.